The Selangor and Federal Territory Association for the Mentally Handicapped (SAMH) aims to provide a sustainable career option for mentally challenged individuals with the launch of its third Sheltered Workshop in Klang. SAMH currently operates two other Sheltered Workshops in Kuala Lumpur and Jinjang South. “We want these workshops to serve as a stimulant for further action,” said SAMH president Datin Fauziah Idris. Fauziah said giving the mentally handicapped a chance to work instilled self-confidence, discipline and a sense of accomplishment. SAMH started as a Non-Governmental Organisation (NGO) with only four students in 1964. Today, the association has an enrolment of over 500 students at 11 special schools and centres in Selangor and the Federal Territory. The new Sheltered Workshop in Klang built on 1.3ha of land donated by the state government, can accommodate up to 100 students. To qualify to work at the workshop, students must complete their basic vocational training and be at least 18. Each student gets a monthly allowance ranging from RM50 to RM500, depending on the volume of work. They are also entitled to the Handicapped Workers Allowance of RM350 monthly. According to Fauziah, the workshop is a stepping stone for the mentally handicapped students. The workshop was built with financial aid from the Apex Club of Klang and Australia with funds raised through various activities. The Apex Club members also provided funding for the start-up of the Klang Special School 1. “The workshop is also designed to instil students with a value system, social conscience, and rules that govern our daily lives and social interaction,” Fauziah said. 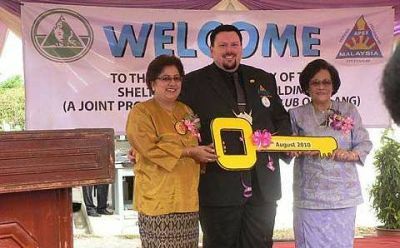 The launch of the Klang Sheltered Workshop was also attended by group homes and sheltered workshop building committee chairman Baharuddin Abu Kassim, National Association of Apex Clubs in Malaysia president Lily Kaur and national vice-president of the Apex Club of Australia Chris Morahan.